where is the potential energy of the particle at position . Let the curve take the form shown in Figure 2. For instance, this curve might represent the gravitational potential energy of a cyclist freewheeling in a hilly region. Observe that we have set the potential energy at infinity to zero (which we are generally free to do, since potential energy is undefined to an arbitrary additive constant). This is a fairly common convention. What can we deduce about the motion of the particle in this potential? However, we also know that a kinetic energy can never be negative [since , and neither nor can be negative]. Hence, the above expression tells us that the particle's motion is restricted to the region (or regions) in which the potential energy curve falls below the value . This idea is illustrated in Figure 2. Suppose that the total energy of the system is . It is clear, from the figure, that the particle is trapped inside one or other of the two dips in the potential--these dips are generally referred to as potential wells. Suppose that we now raise the energy to . In this case, the particle is free to enter or leave each of the potential wells, but its motion is still bounded to some extent, since it clearly cannot move off to infinity. Finally, let us raise the energy to . Now the particle is unbounded: i.e., it can move off to infinity. In conservative systems in which it makes sense to adopt the convention that the potential energy at infinity is zero, bounded systems are characterized by , whereas unbounded systems are characterized by . 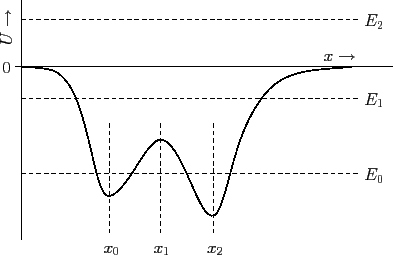 Figure 2: A potential energy curve. In other words, a equilibrium state corresponds to either a maximum or a minimum of the potential energy curve . It can be seen that the curve shown in Figure 2 has three associated equilibrium states located at , , and . at any point (or in any region) then we have what is known as a neutral equilibrium point. We can move the particle slightly away from such a point and it will still remain in equilibrium (i.e., it will neither attempt to return to its initial state, nor will it continue to move). A neutral equilibrium point corresponds to a flat spot in a curve. See Figure 3. Figure 3: Different types of equilibrium point. where and . Note that the particle reverses direction each time it reaches one of the so-called turning points ( ) at which (and, so ).